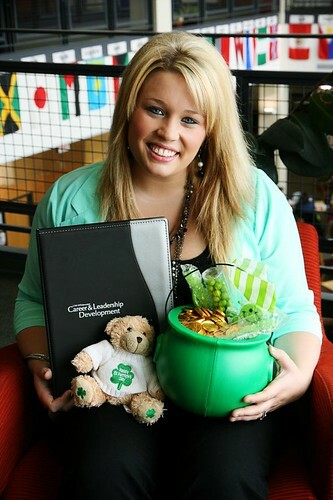 Congratulations to our UW-W Career Cover Model winner for the month of March, senior Kelsey Ostby! Kelsey is double majoring in Public Relations and Journalism. She was an intern with the Wisconsin Farm Report during the summer of 2012. Read all about her experience below! I had an amazing opportunity to work with one of the most successful female broadcasters in the Midwest over the summer, and have just recently accepted a full-time job with the Wisconsin Farm Report beginning in June 2013. Currently, I am working part-time from Whitewater, doing website and social media updates while completing my final semester. What did you love most about your internship? I love giving back to some of the hardest working people in the country: farmers and producers. Whether it’s by attending an event, giving the daily market information on the radio, or recognizing a family for their outstanding work in Wisconsin agriculture, I have discovered my passion. UW-Whitewater has truly set me up for success, and I love that I am able to use the skills I have acquired. I think it’s a rare occurrence to be a senior preparing to graduate with a double major completed in four years, and have a full-time job secured. What did you learn about yourself through this internship? After growing up on a dairy farm and being involved in agriculture throughout my childhood, I thought that I wanted to do something different and explore other options in college. I had hoped that I would end up on television reporting from the sidelines of a football game. Looking back, I realize that I was lucky enough to find what I loved at a young age, and that it never left. I completed numerous internships in the past few years, including working with the UW-Whitewater Marketing and Media Relations office and the UW-Whitewater Sports Information department. While I’ve had great experiences at both, there was always something missing. When I took the internship with Pam, I knew right away that it was what I wanted to do, but never thought I could get there. So, in retrospect, I have learned to give myself more credit. I also discovered what I am good at, and what skills I can sharpen during my last semester. What advice would you give students about the job/internship process? The best advice I can give other students is to apply for internships and jobs early and often. I took my first internship the summer after my sophomore year, and it was the best decision I made. Most of my classmates thought internships were something you worry about after your junior year, and I think it’s the exact opposite. As a college student, your main priority should be setting yourself up for a great career. The best way to do that is to get as much experience as possible so you know what you like and dislike. Also, take every opportunity offered if possible, paid or unpaid. I had some of the best experiences from my first, unpaid internship. There is no such thing as a “bad” opportunity. Would YOU like to be a Cover Model winner? You can fill out the contest application and send it to MediaCLD@uww.edu!